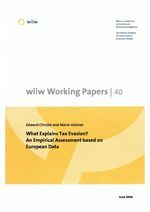 This study computes estimates of tax compliance in selected European countries for value added tax, excise tax, personal income tax and social security contributions, using national accounts data together with data on official tax structures and revenues. These estimates are then analysed to explain the differences in compliance rates across European countries and across time. In accordance with the classical models of Allingham-Sandmo and their successors, we find that tax evasion is positively correlated with the tax rate itself. However, we also find support for Bloomquist's hypothesis that higher income inequality leads to higher tax evasion. We also find that the quality of the judicial system plays a role in explaining VAT evasion, confirming general hypotheses on the main drivers of the shadow economy. Finally, we find that our chosen measure of tax complexity is positively correlated with tax compliance for personal income tax, leading us to doubt the soundness of 'flat tax' reforms in transition countries, at least with respect to their impact on compliance.